La Maison du Cacao (Cocoa House) is a memorable place to learn more about the history of cocoa. You will also be able to see the different stages of the cocoa production as well as a guided tasting experience. The cocoa tree comes from Central and South America more precisely from Mexico and Amazonia. 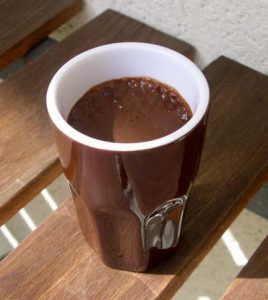 The cocoa culture began in Guadeloupe Archipelago during the 17th century. At the moment, the cocoa manufacture is still happening in the archipelago even though the level of production is less important than sugar cane or banana. Sometimes it is quite difficult to make a clear distinction between Cocoa and Cacao. To clarify, Cocoa starts the same way cacao does, as harvested beans from the plant’s seed pods. However, when processed the cocoa is heated at much higher temperatures. La Maison du Cacao is at the heart of a former place where cacao was produced. To access the site, you will need to go to Pointe-Noire Township in Basse-Terre Island. The main purpose of La Maison du Cacao is to help you understand the various phases of cocoa production. Bilingual (English and French), knowledgeable and passionate tour guides will make outstanding presentations and answer all of your questions. The tour lasts approximately 1 hour. The first part of the visit is a tour of the nice tropical garden showing how the cacao plant grows. There are multiple species of cacao trees: Criolo, Forestero, or Trinitario. The second part consists of a demonstration on the cocoa harvest, fermentation, roast and grinding with some tasting at each stage. 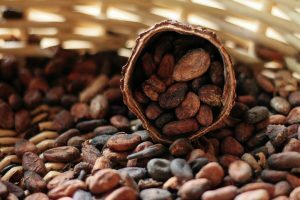 You will have the opportunity to sample from the raw cocoa pods to the nibs to the final chocolate product all the way through. Then, you will see the various types of chocolate from white to milk to pure cocoa chocolate as well as local cacao-based products. Finally, the visit will end by tasting a delicious homemade hot chocolate. Most importantly, you will be able to purchase raw cocoa products in the souvenir shop. If you want to extend this unforgettable experience, this is the place to go. The choices are endless including: cocoa butter, cocoa paste, cocoa beans jam, chocolate bars and punchs. Therefore, don’t forget to end your visit at the souvenir shop whether it is to buy chocolate gifts or just treat yourself. Sign up to receive the latest Guadeloupe Archipelago posts directly in your inbox when they go live on the site. Never miss another post! Guadeloupe : French Caribbean archipelago © 2019. All Rights Reserved.